Cow’s milk contains casein, a protein that becomes more concentrated in the cheese-making process. It’s basically a beadlike string of amino acids that the body tries to break down but can’t completely. Some beads stay attached in shorter strings called casomorphins. These protein fragments can attach to the opiate receptors in your brain. As the name implies, casomorphins are casein-derived morphine-like compounds. “Say ‘cheese'”? You’d better rethink that. Here’s why: Cow’s milk contains casein, a protein that becomes more concentrated in the cheese-making process. It’s basically a beadlike string of amino acids that the body tries to break down but can’t completely. Some beads stay attached in shorter strings called casomorphins. There are other reasons to kick the cheese habit. Cheese is loaded with fat and salt and like all dairy products—along with meat and eggs—has been linked to heart disease, obesity, diabetes, and even cancer. Cows on modern dairy farms are usually impregnated by artificial insemination. After their calves are torn away from them, usually within a day of birth, mothers are hooked up to milking machines two or more times a day. Sometimes, they’re injected with growth hormones, which can contribute to rising incidents of mastitis, a painful inflammation of the udder and a main reason cited by dairy farms for sending cows to slaughter. The average cow produces four times as much milk as one did in 1950. A cow’s natural lifespan is about 20 years, but farmed cows’ bodies are worn out from being constantly pregnant and/or lactating by the time they’re about 5 years old, at which point, they’re slaughtered. Their bodies are turned into soup, food for dogs and cats, or ground beef. If you’re looking for a vegan cheese that will make a nice gooey, melty grilled-cheese sandwich, try coconut-based Vegan Chao Slices from Field Roast. Speaking of slices, GO Veggie! and Daiya cheeses fill out a Tofurky baloney sandwich very nicely. Daiya also has spaghetti-ready mozzarella shreds, three kinds of made-for-snacking wedges, and—hello, onion bagel—cream cheese. Tofutti makes a tasty cream cheese, too. If nachos are on the menu, Nacheez has the sauce. And if you want to get all artisanal, Punk Rawk Labs (available at VeganEssentials.com) and Kite Hill have you and your crackers covered. 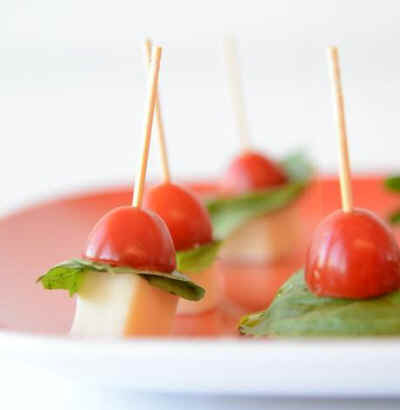 Tomato, basil, and vegan mozzarella caprese hors d’oeuvres. Made with Follow Your Heart cheese.